Stop messing with tape and glue. Our Naturalle Collection is a collection of invisible [transparent] front lace line wigs that do not require any tape or glue. It doesn't get any easier than that. The Lace contours to your forehead and, with a simple application of foundation, disappears giving you a beautiful, natural looking hairline. Different cap constructions offer endless styling possibilities. 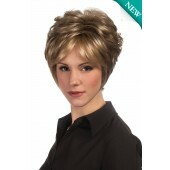 From lace part to monofilament top to 100% hand tied back, there is a wig that is sure to match your needs. Feel beautiful and look beautiful.